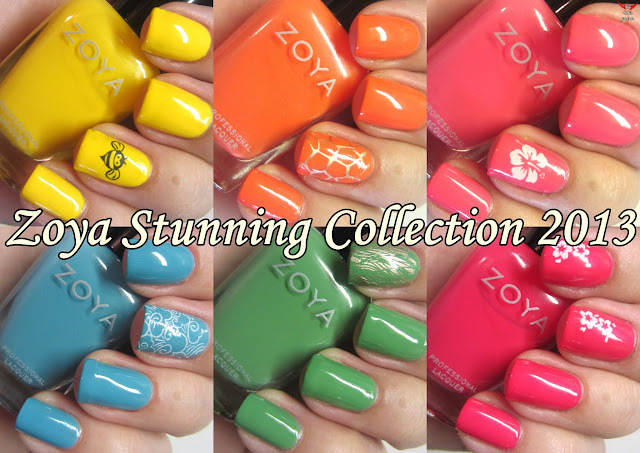 I have a beautiful collection of bright cremes from Zoya that just scream summer!!! They are from the new Stunning Collection which was recently released. "Stunning" is pretty fair name for this collection. While the finishes aren't really wild, these are some very bright colors that really pop on the nails. All are two coats with topcoat except Darcy (the yellow creme) as this polish required a third coat. A bright yellow cream. Opaque in 3 coats. Formula was good. This leans more toward a orangy shade of yellow than a true neon yellow. It's quite lovely. I love this orange. It's just a shade brighter than a pastel orange. Not harsh at all. Would work well with a lot of skin tones. Formula was good on this. It was opaque in 2 coats. This polish is so fine, it's so fine it blows my mind. LOL! It's a lovely light pink creme. It is nothing at all close in shade to the hot pink creme you'll see last in this collection. The formula was good and the finish was opaque in two coats. This is one of my faves in the collection. I probably own a dozen of these blues. I'm a sucker for that "just a shade darker than pastel" color of blue. This is so pretty! And the formula is great! It was opaque in two coats. Josie is a grass green creme polish. Good formula. Opaque in 2 coats. Not your typical green here. This favors the orange of the collection in that they are both earthy looking tones versus true brights. I wish this polish had been named Micky instead of the other pink...because I really want to sing about this color. It is a hot fuchsia pink lovely creme. It's easily my fave of the collection. So much so, that I painted both my hands and my toes and wore this gorgeous color around for a few days on a little mini vacay I took earlier this week. This color really favors those with a darker skin tone. It brings out tan really well. The formula was great and opaque in 2 coats. The formula and coverage on these is great! There's barely any clean up. They don't dry quite as quickly as some other polishes, but they're worth the wait. If I had to pick the "must haves" of this collection it would be Yana and Rocky for sure with Yana being the number one for me. If you use my link to sign up for an account with Zoya you will instantly receive a free Zoya nail polish. Special thanks to Zoya for providing these lovely polishes for me to show you guys today. So what do you think of this collection? Do you have any yet? Are you getting any?